Mt. 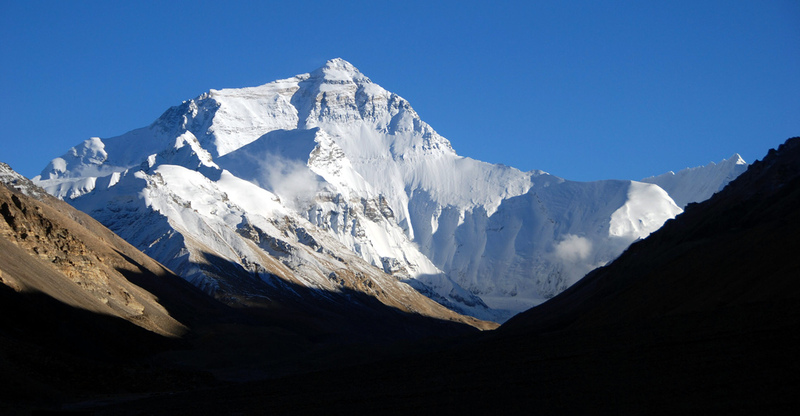 Everest, Tibetan Chomolungma (Goddess Mother of the Universe), is the highest mountain peak of ten eight thousand metres peaks located in the Central Himalayas and also the highest peak in Asia and the Earth. Its height is 8,848 metres above sea level. West and south summit of Mt. Everest form the border between China (Tibet) and Nepal. On the Nepalese side is part of the Sagarmatha National Park, which is a UNESCO World Heritage Site. In the close vicinity of Mt. Everest you can find other three 8000 metres peaks – Makalu (8,485m), Lhotse (8,516m) and Cho Oyu (8,188). Not far from the base camp of Mt. Everest (5200 m), where tourists usually go out early in the morning at sunrise, we can at an altitude of 4980 m above sea level find Rongphu monastery, probably the highest altitude monastery in the world, the space serves as a hostel for tourists who want to spend the night in a record altitude. Scenic flights are organized around Everest from the Nepalese Kathmandu.